Synthetic cannabis is a family of psychoactive designer drugs derived of natural herbs sprayed with synthetic chemicals that, when consumed, allegedly mimic the pleasurable effects of cannabis. Synthetic cannabis is best known by the brand names such as K2 and Spice, both of which have largely become generic trademarks referring to any synthetic cannabis product. As the "herbal highs" market continues to boom, added synthetic cannabinoids are frequently exchanged to stay at least one step ahead of legal restrictions. AM2201 (1-(5-fluoropentyl)-3-(1-naphthoyl)indole) C24H22FNO (MW=359.17, structure at right) is a synthetic cannabis compound that acts as a potent agonist for the cannabinoid receptors CB1 and CB2. Its binding affinity to the CB receptors (activity) is about 15-40 times greater than of tetrahydrocababinol (THC) itself, which is the main natural active ingredient found in cannabis. The analysis of synthetic cannabis such as AM2201 is relatively simple and can be performed with any standard GC-MS. However, it requires sample preparation which often takes more time than is generally available in busy forensic laboratories. Thus, the main challenge in synthetic cannabis analysis is how to perform it with minimal sample preparation and chromatography time. In this post we show the fast sample preparation of herb leaves for the analysis of AM2201 using the 5975-SMB GC-MS.
We used the Aviv Analytical 5975-SMB GC-MS with Cold EI for the analysis of AM2201 on herb leaves. Sample preparation was very simple and quick, and included dipping a few leaves in few ml of methanol in a glass vial, ~3 min of sonication and injection of the methanol "extract" as is. We used such a simple form of sample preparation since the searched synthetic cannabis drug was spayed on the leaves hence standard laborious extraction procedures could be avoided. In addition, no sample cleanup was needed as the 5975-SMB GC-MS with Cold EI can uniquely elute all the sample compounds that are vaporized by the GC injector at 250ºC and enter the column. 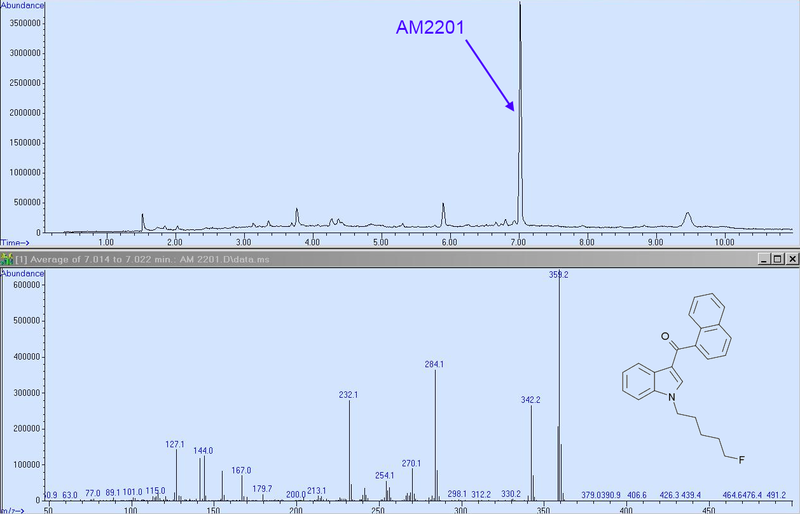 As shown in Figure 1 below, the AM2201 compound was found and it is the biggest total ion count peak in the mass chromatogram (upper trace). The high quality Cold EI mass spectrum is shown at the bottom trace having a dominant molecular ion and characteristic high mass fragments. The use of methanol washing instead of standard full leaves extraction resulted in the observed high ratio of AM2201 peak to leaves background as the leaves internal compounds were not fully extracted. We could use such a simple washing-extraction procedure due to the 5975-SMB unique capability to use short columns and high column flow rates. As a result, the leaves background fully eluted at the end of the analysis, leaving the column clean and ready for next analysis. 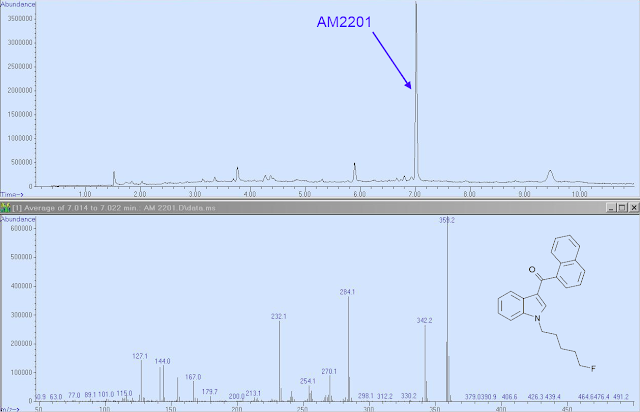 The first matrix peak in Figure 1 that eluted at 1.5 min is of nicotine, hinting towards tobacco origin of the "herb", and the last to elute peak at 9.5 min has a molecular ion of m/z=630.5 (unidentified). Fast AM2201 analysis of 11 minutes chromatography. High ratio of AM2201 TIC peak to herbs background chromatogram. Compatibility with a fast and easy sample preparation method. Symmetric tail-free GC peak of AM2201 was obtained since the column is "clean" and ion source tailing is inherently eliminated in the Cold EI fly-through ion source. Provision of high quality Cold EI mass spectrum of AM2201. Sample: Methanol sonicated Herb leaves solution without any cleanup or standard extraction. Oven: 50ºC followed by 30ºC/min to 320ºC and 2 min hold for total of 11 min. 5975 mass range: 50-700 amu at about 2.6 Hz scan frequency.